The Windows Phone 8 based Lumia 920 takes pride in its optical image stabilization and PureView camera for better low light performance, but those are areas in which HTC has brought huge improvements as well. Of course, “One phone to rule them all” is a jab at the HTC One. Nokia has now adopted this somewhat arogant hot-headed attitude towards its rivals while the company itself is struggling to get traction with customers. Is this the right approach? What do you think? 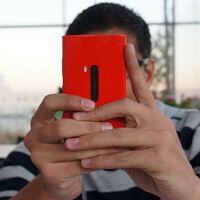 Hey, and stare closely at the image, and you'd see Nokia used our own PhoneArena logo on the image! i will wait when samsung announces new devices on 2013 then u will be hiding under your bed coz its just "meh"
After looking at samples from HTC one something, I would say FTW NOKIA YAY!! A samsung fan talking about innovation !! LOL !! dear stupid person, if people all over the world already converted to an android ecosystem or ios... then why dont fans come here and counter our dislikes since you believe that android phones (samsung,sony, htc,lg,huawei,alcatel etc) can overpower 1 company named nokia ? About 50% of the smartphones are made by samsung. Your f***ing nokia have nothing. . Sales aren't everything. If they were, we'd all be using iphones and driving Toyota corollas. *shudder* Why is the most common phrase from androiders (and iphonies) "wait and see"? Whereas Nokia Winners are happy and excited by what they already have? Common even motorola's vga camera is better than galaxy's 8mp :D WARNING: Apply cold water to burned area. You are a joke.......get a life! Five more days!! Bring it on!! Only then well we know who rules them all! !